Beat butter, sugar and vanilla until creamy. Add eggs, one at a time, beating well after each addition. Gradually add the flour and almonds and mix to a firm dough. Wrap in plastic wrap and refrigerate for at least 3 hours, or until very firm. Divide dough into 4 portions, roll out one portion 5mm thick and refrigerate the remainder until required. 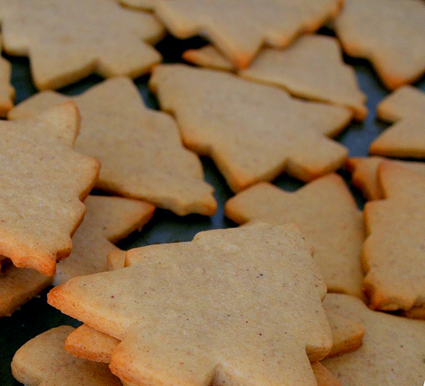 Using biscuit cutters in Christmas shapes cut out the dough (Christmas trees, angels, stars, etc.). Repeat with remaining dough. Bake on a greased and lined baking tray at 180C for 10 – 12 minutes, or until golden. Store in an airtight container. Dust some of the shapes with icing sugar before serving.